Methodist Children s Hospital opened in 1998 as the only hospital in San Antonio and South Texas designed and built especially for children. Colorful images and artwork enhance every window and wall to create a welcoming, child-focused environment that includes a two-story tree house in the lobby, play rooms on every floor, and an outdoor play area. 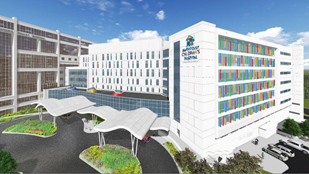 The Methodist Children s Hospital offers 24-hour pediatric emergency room, pediatric and neonatal intensive care units, pediatric operating suites, and special outpatient clinics for children with complex illnesses. Methodist Children s Hospital features the region s only blood and marrow stem cell transplant program offering hope for children with leukemia, sickle cell anemia and immunodeficiency syndromes such as SCIDS (severe compromised immune deficiency syndrome). In addition, Methodist Children s Hospital has a complete unit devoted to hematology, oncology and transplants. The Methodist Children s Heart Institute features a multidisciplinary team of experienced board-certified pediatric cardiologists dedicated to complex congenital cardiac and thoracic diseases, from prenatal diagnosis through adulthood. With six cardiac catheterization suites, the Methodist Children s Heart Institute is the only hospital in South Texas providing interventional and diagnostic procedures including PDA coils, balloon septostomies, balloon dilations and ASD device closures. Cardiothoracic specialty areas include neonatal and infant heart surgery, single ventricle and hypoplastic left heart syndrome, arrhythmia surgery, beating heart surgery, cardiac failure and mechanical support.